SPLASH is a paradise for kids and adults! Our condo is on the 7th floor of the West Tower. 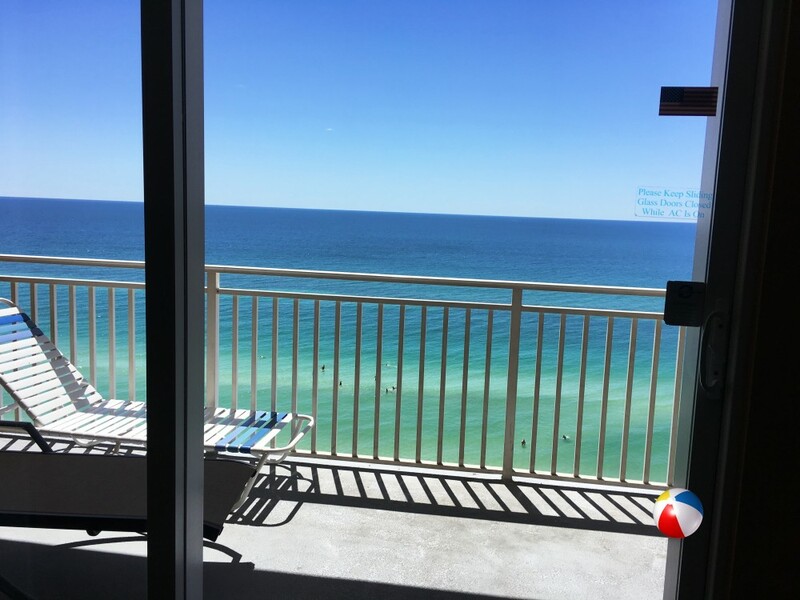 You can enjoy the gorgeous views of the Gulf of Mexico from your private balcony. It features tiled floors, a washer and dryer inside the unit, fans in the living room and both bedrooms, a fully equipped kitchen, a dining area that can seat up to 6. LCD TVs in the master bedroom, living room and guest room. FREE long distance calls in the U.S. and Canada, wireless Internet, cable TV and Netflix movies and programming. Our unit has a large master bedroom with wonderful views from the golf, it has comfortable king size bed, a bathroom with a garden bathtub, and dual sinks. The Guest Bedroom has a comfortable queen size bed and the living room has a queen size sleeper sofa with 6” innerspring mattress. Guests have access to a lazy river, swimming pools, indoors water park, Jacuzzi, arcade with a mini bowling alley and our beautiful beach. Guests can also enjoy a state of the arts fitness center while looking at the crystal clear waters of the Emerald Coast. Two barbecue grill areas, and poolside bar and grill, on site Alvin's Island, and a grocery store. No check-in or checkout necessary! New Resort Lock system allows everyone in your party entry without the hassle of keeping up with multiple keys or check-in/check-out lines! Front door lock features a push-button combination lock where you can program your own unique access code for your exclusive use during your stay, eliminating the need for a physical key or magnetic card. We can easily accommodate last –minute renters by assigning key access codes over the Internet. Pier Park is only minutes away from Splash. You can enjoy a wonderful shopping and dining experience. Visit Jimmy Buffett’s Margaritaville, Red Brick Pizza, Reggae J’s Island Grill, Five Guys Famous Burger & Fries and many others. There are many specialty shops, as well as department stores like Dillard’s, JCPenney, and Target. Also located in Pier Park is a 16 Grand Movie Theater. There is an amusement park for the kids and when you are ready to leave go across the street and walk the pier. Doesn’t get any better than this. AREA ATTRACTIONS From pirate ships and animal parks to go-carts and giant slingshots, there are boatloads of Panama City Beach Florida attractions for the young and young at heart! It’s never a dull moment on the beach that fun built. Florida beach attractions don't get any better than this. Explore Florida nature in Panama City Beach, fishing, biking, hiking, swimming, tubing, canoeing, kayaking, boating and bird watching are just some of the countless opportunities for ecotourists to explore Florida nature in Panama City Beach.